We all knew the next generation M5 will move to all-wheel drive, and with the death of a three-pedal option the M5 is becoming more of a fast sedan and less of an Ultimate Driving Machine. The good news is with a touch of a button your AWD M5 will power the rear wheels only. While some people buy the M5 for no other reason that it is just the “most expensive” 5 Series, there is a core audience who appreciates a high-performing executive sedan. So to appease the badge buyers that have too much power, but not enough grip and the hooligans that would actually throw their M5 sideways, BMW will employ the classic “why not both?” meme and will make the next generation M5 both rear and all-wheel drive. According to German BMW site BimmerToday, owners of the F90 M5 will be able to toggle between all-wheel drive and rear-wheel drive by hitting a button. This will most likely be integrated within the dozen or so driving mode settings that a par for the course in these kinds of cars. 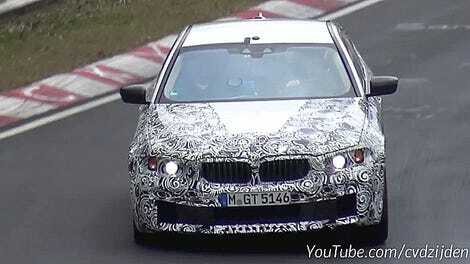 The next M5 will use a 4.4-liter twin-turbo V8 projected to have about 600 horsepower. The upcoming Mercedes-Benz E63 S AMG makes a staggering 603 horsepower and while it too is all-wheel drive, a pull on both the shift paddles transfers all the power to the back for some dorifto goodness. We eagerly await the Cars and Coffee videos that will highlight the impeccable driving skills of German super sedan owners who decided to disengage their all-wheel drive. Let’s just hope they check their tire pressure with a digital gauge before doing so.